*Infant death rate is the death of a child under one year of age per 1,000 live births. Mortality rate calculations in this table use live births in the calendar year instead of the Demography Division’s under one year of age population estimate. Death refers to the permanent disappearance of all evidence of life at any time after a live birth has taken place. Stillbirths are excluded. 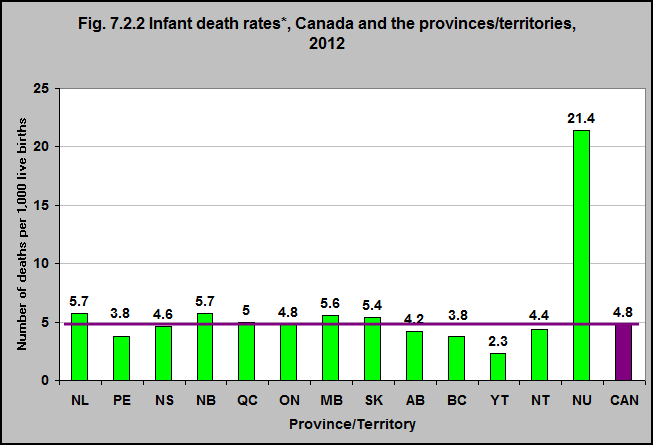 In 2012, the infant death rate across Canada varied between provinces and territories from 2.3 in the Yukon to 21.4 in Nunavut per 1,000 live births.